[Jesus said,] "In addition, the Father judges no one. Instead, he has given the Son absolute authority to judge, so that everyone will honor the Son, just as they honor the Father. 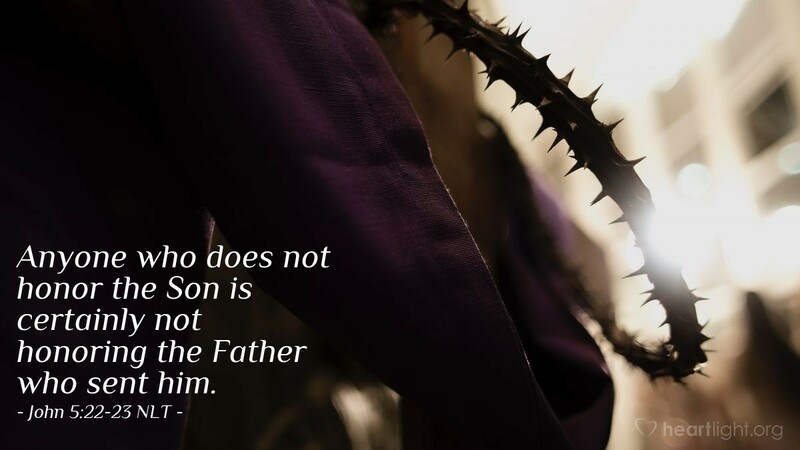 Anyone who does not honor the Son is certainly not honoring the Father who sent him." "Pay ... honor to whom honor is due!" (Romans 13:7 NRSV) I can't think of anyone more worthy of honor than the Son of God. He left the glory of heaven and became human. He lived among ordinary people and was killed by common hands and thereby became a sacrifice for human sins. He was raised from the dead as the Father's powerful Son and has now ascended to the Father's right hand in glory. He will return in the clouds with unlimited and unveiled glory for every eye to behold. He will take all those who have loved him and lived for him home to glory. How can we not honor him and the Father who sent him? How can we not long for his coming in glory? All praise to Christ the Lord, our King, Savior, Brother, and Friend. Bless me this day, dear LORD, and each day that follows so that my life brings honor to Jesus. Christ Jesus, please receive my praise as a gift of my love. You are worthy of my praise because of your sacrifice and the salvation you provide. I praise you and proclaim that Jesus Christ is Lord! Amen.